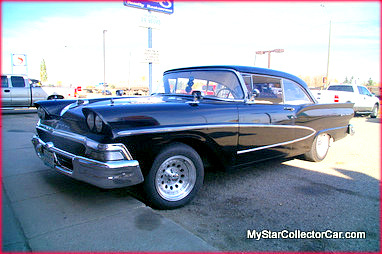 Typically there’s a beginning, middle and an end to a car’s life cycle but this 1958 Ford two-door hardtop enjoyed a resurrection. These Fords were very common sights back in 1958 but over the years they suffered a higher casualty rate than Custer at Little Big Horn. This car had an exceptionally bleak future when its original owner parked it in the bush a few decades ago because the gas tank leaked. Apparently the new car aura had dissipated. That would have been the gloomy end of the story except for a guy named Lloyd Stansall. Lloyd found the car and decided “it looked pretty straight” plus he was undaunted by the reality that this ‘58 Ford was now not only in the bush – it was part of the bush. Lloyd was pragmatic about the problem so he brought a chain saw and cut his future project out of the bush. Lloyd added, “The original owner was a funny guy, I asked him what he wanted today and he said 300 bucks today but tomorrow I’ll want more. He had me right there so I thought I’d better buy it”. Veterans of car projects will recognize the potential for disaster with a project like this but they can also appreciate the strength of will, money and talent that bring cars like this ‘58 Ford back to life. The interior was a disaster because stationary cars in wooded surroundings provide the perfect home for vermin like mice and squirrels. 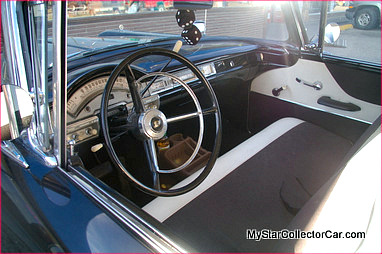 This Ford was no exception as Lloyd added, “its interior was falling apart and a window was broken”. The other factor that dooms old iron in the wild is water. In this case Lloyd explained, “That car had dual exhausts plus the butterfly was open on the carb and there was no air cleaner moisture crept up and the engine was stuck harder than cement”. Lloyd tore it down and found out that the original 332 would have to bored 80 over to have any chance of a decent rebuild. The math was clearly stacked against the original block. The project took over twelve years, Lloyd added, “working on and off when I could”. He put in a completely new interior because every panel was gone and the headliner was a complete disaster. 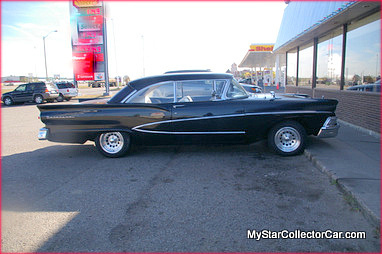 Lloyd picked up a 312 motor out of a ‘57 Mercury and added 292 heads for lower compression. He went through three transmissions before he came up with the right combination for the venerable old Ford. He explained, “It took 3 transmissions to make one but it doesn’t have a passing gear. Still gets to 70 pretty fast”. Lloyd also admitted that he parted with 5 figures worth of real money to get this old Ford back to roadworthiness. The roadworthiness part was scrutinized carefully because the Ford hadn’t been registered in decades so it had to pass a stringent out of jurisdiction inspection to be registered again. Lloyd was happy to report, “The only things they could find were a loose ball joint, brake hose and steering bushing”. 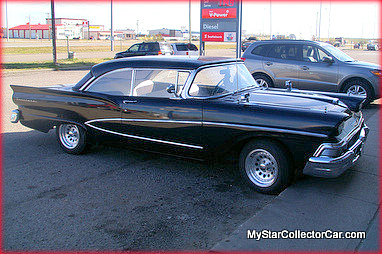 Lloyd has enjoyed thousands of miles behind the wheel of the ’58 Ford and he’s only had one minor issue as he recalled, “when I went around a corner it started blowing oil so it turned out to be a seal problem.Other than that, the car has been great”. He’s also pleasantly surprised by the gas mileage,” it’s been pretty good on fuel. I took the Holley off and added an Edelbrock”. Despite the long journey out of the bush and the considerable cost associated with the ‘58 Ford’s resurrection, Lloyd truly enjoys life behind the wheel of this 50s classic. He’s made it a daily driver during the mild part of the year so he has it on the road in early spring and takes it off the road in late fall. 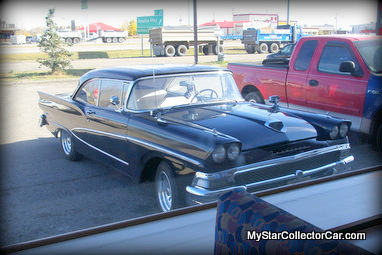 Lloyd and his Ford are regulars at his favorite coffee shop – the car has almost become a mascot for the restaurant. 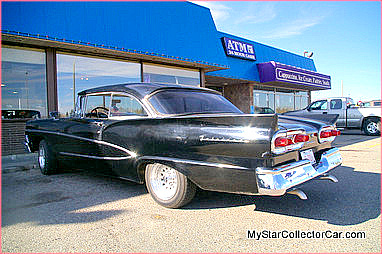 Clearly this ’58 Ford is back from the bush for good.